How Do We Define a Cardigan Sweater? Who doesn't love a cardigan? It's one of the comfiest and most versatile sweater styles around. It's also hard to believe there was a time in knitting history when the cardigan didn't exist. Yet, this versatile garment wasn't developed until sometime around the mid-1800s. A cardigan is a type of sweater that was traditionally made of wool and has an open front. Today, cardigans can be made from a variety of materials and they are either left open or have the ability to button or zip up. Cardigans can be made in a V-neck or scoop neck style. They can be worked in many different ways, from the traditional boxy shape of grandpa and Mr. Rogers sweaters to fine-gauge twinsets. Cardigans can also incorporate lace, cables, Fair Isle patterns, cropped styling, short sleeves and more. How Did the Cardigan Get Its Name? The cardigan is named after James Brudenell, also known as the 7th Earl of Cardigan. He was a commander of British forces during the Crimean War, along with another name that's known among knitters: Lord Raglan. Brudenell led the ill-fated Charge of the Light Brigade during the Battle of Balaclava (yet another knitting term). The battle is immortalized in a poem by Alfred Lord Tennyson, but that's not the part of the story we're interested in. 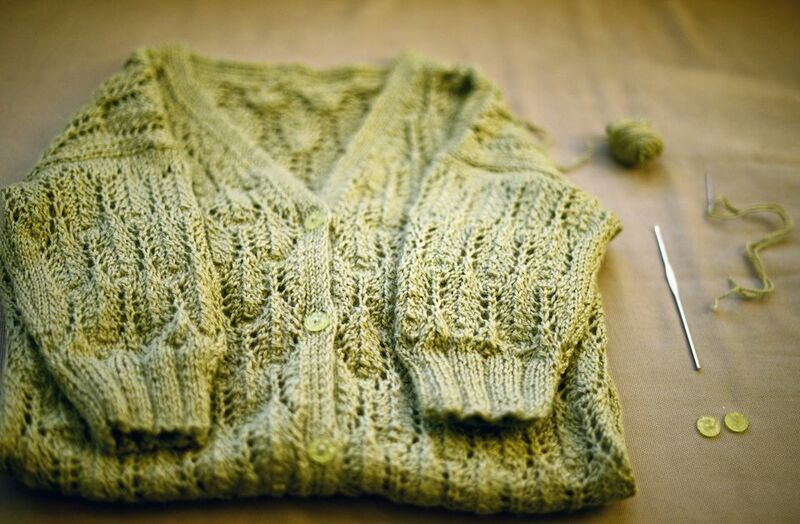 Richard Rutt, who did the research for us in his book "A History of Hand Knitting," notes that Cardigan probably didn't actually wear a cardigan during the war. This despite the fact that he would have found it useful in the cool nights of the fall he spent in the Crimea. It's likely, Rutt says, that he started using the distinctive open sweater during his later life. Brudenell lived in the English countryside at Northamptonshire, where his house was no doubt quite cold. Rutt notes the first appearance of the word cardigan in a knitting context happened in 1868, the year Cardigan died. Since that time, the style has remained in fashion trends and popularized through the years by Coco Chanel, Elsa Schiaparelli, Princess Diana, and Michelle Obama. The cardigan is a useful sweater because you can throw on one without the hassle of a pullover. They can be super comfy sweaters to wear around the house and double as a cool weather jacket, or they can be simple, sweet, and elegant, perfect for a night out. Baby's First Cardi - Try out your sweater building skills with this adorable and simple baby cardigan. Ballet Wrap Cardigan - This toddler-sized pattern is super cute and the perfect way to keep your ballerina warm between numbers. Puff-Sleeve Cardigan - A cropped, short sleeve cardigan, this pattern has an impressive fitted shape and looks fantastic over a spring or summer dress. 20 Gorgeous Crochet Cardigans - If you enjoy time with the crochet hook as well as knitting needles, you will not want to miss any of these stylish patterns. Cardigans can be a little scary for new knitters, but they don't have to be. You simply need to understand the pattern before casting on so you know how each piece will work in the sweater. A book like "My First Cardigan Workbook" can help ease your fears and aid in making your first cardigan a success. Why Are Slanted Sleeves 'Raglan' Sleeves?